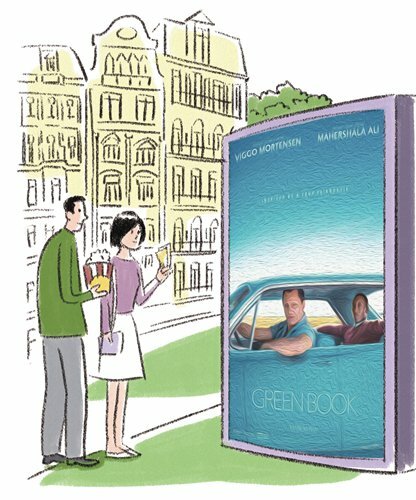 Not a moviegoer, I was exposed to the overwhelming praise of the Oscar's best picture Green Book both online and otherwise. Several of my friends' undying acclaim forced me to walk into the overcrowded cinema in Beijing on a Saturday night. It indeed didn't let me down. The audience, including me, constantly burst into laughter through the entire movie. A girl in front kept telling her companion that she would watch it again. I enjoyed the movie just as much as she did and it left me with an unsatiated curiosity about its surprising popularity in China. Taking a glance at China's box office ranking, the top three Chinese movies are Wolf Warrior 2, Wandering Earth and Operation Red Sea, while top Hollywood blockbusters are The Fate of the Furious and Avengers. It seems Chinese audience show special preference for local productions demonstrating the country's strength. They also prefer Hollywood movies with celebrities, spectacular locales and high-end visual effects. Green Book, however, has neither of these elements. In addition, the story's historical context is far from familiar for Chinese people. But those "limitations" have not at all affected the fact that the movie is a hit in China. The film has taken more than 448 million yuan ($66.7 million) at box office, and earned a score of 8.9/10 on an influential Chinese film discussion portal (better than 98 percent comedies and 97 percent dramas). In contrast, I noticed that there is widespread criticism about the movie's oversimplified portrait of racial conflicts inside the US. Then what on earth makes the American film so popular in a foreign land, China? It is precisely because of most Chinese people's scant knowledge about the storyline's historical background, so that the audience can focus on the good story, lifelike character images and rich emotions. Except the racial conflict and class segregation, puzzles brought about by prejudice, misunderstanding and stereotypes are universal in every nation. I was touched by the rare friendship between the two leading characters who belong to distinct racial groups and social classes, the vulgar but precious love between "Tony Lip" and his wife, and the warmth exuded by families and strangers. Unlike the furious and direct emotional expressions in most American movies, the gentle but lifelike emotions conveyed by the film are more to Chinese audience's taste. In addition, the Chinese audience seem to resonate with and are impressed by lines like "My father used to say, whatever you do, do it a hundred percent, when you work, work, when you laugh, laugh, when you eat, eat like it is your last meal." "The world's full of lonely people afraid to make the first move." "You never win with violence. You only win when you maintain your dignity." These classic lines have been widely circulated on Chinese social networking platforms. China's film market is regarded a treasured place by Hollywood. In recent years, it is not hard to find that an increasing number of Hollywood blockbusters have included Chinese elements in a bid to cater to Chinese movie fans. Many a Chinese star is found in Hollywood movies such as Jay Chou in Now You See Me 2, Fan Bingbing in Iron Man 3, and Zhou Xun in Cloud Atlas. China's representative symbols like panda and dragon, and landmarks such as the Great Wall, all appear on Hollywood screens from time to time. Nevertheless, in most cases, Chinese elements not only fail to help win the box office, but cause a stink. Crazy Rich Asians, a Hollywood movie with an all-Asian cast, earned merely 11.5 million yuan plus a terrible word-of-mouth in China.